'Tis the season for proposals, engagement parties and weddings! If you're planning an event of your own, you might be overwhelmed with all the inspiration to be found online. Teleflora is a great resource for ideas if you are looking to decorate your engagement party with gorgeous spring and summer blooms. Take a look at the list below to see how to make today's trends work for you! Invite your guests to celebrate your upcoming nuptials by raising a glass with you! Encourage your loved ones to bring a bottle of wine to share, or host a swap where each person takes home someone else's favorite vino. Keep plenty of wine glasses on hand, along with appropriate food options for pairing, depending on the kinds of wine you'll be sipping. You can fill out the table with an elegant spread of great cheeses (fresh, aged, soft and hard) and baguettes. For a few extras, opt for an olive bar, hummus and pita bread, and even grapes, strawberries and sliced apples. If you go the extra mile and hire a sommelier to guide the tasting your guests are sure to be impressed. Host your celebration on a rooftop overlooking your city. Rooftop bars and restaurants offer an intimate setting with a stunning view, and you can choose accents to fit your style. For a casual, shabby-chic affair, string some lights above your guests and serve drinks in kitschy mason jars. For a sophisticated event, hire cocktail servers and invite everyone to don their best attire. Turn a BBQ into a classy occasion by replacing picnic blankets and paper plates with white linens, woven placemats and rustic chargers. Serve fruity cocktails and iced tea in jam jars, include banks of candles for an intimate touch, and go gourmet with pulled pork sliders and truffle mac and cheese. Float flowers in decorative glass bowls filled with water. Lilies are great for a bright pop of color. Lacy hydrangeas make an elegant statement. Orchids are an exotic touch to any table. For nighttime party centerpieces, add LED lights in the bottom of the bowls to add unexpected color. Blue LED lights are ideal for tropical or resort themes. White lights go well with more modern affairs. For daytime engagement parties, add food coloring or dye to make the water a colorful shade. For a rustic-themed party, use some succulents in a bamboo box to surround the tables that will make your guests feel like they've stepped into a garden party. This is a modern take on a vintage motif, and it's a charming touch. Or, create a display of pictures of the happy couple and surround them with blossoms. You can make this trend work for any design you like. Place single blooms in small bud vases to act as place cards for your guests. You can tie a bow around each vase with names written on it for an added touch. The flowers will double as a centerpiece and give the whole party a fresh feeling. 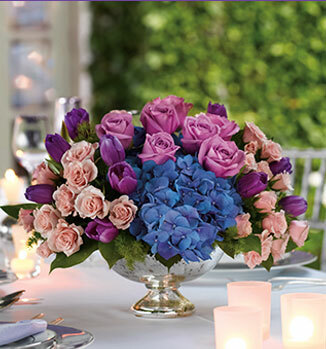 Follow Teleflora’s Tablescapes & Centerpieces board on Pinterest.